TBS DT: Wings & Insects Week! Hello crafty friends! I hope you had a beautiful weekend. We're in the final week for our Beary Sweet Challenge using a "Wings" theme. We have some great entries and hope to see yours, too. You could win a $20 gift voucher from The Beary Scrap! This week the design team is adding an insect to our winged projects. This ought to be fun! I've made another tag - oh how I love working on this small "canvas"! The Basic Grey Capella line is quite delicious, and I've chosen this vine design as my "jumping off point". 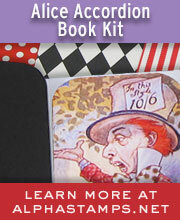 This design is sold out but you can find a similar one with BG's Figaro paper - check it out! Even though this tag isn't a "busy" one, it's full of technique. 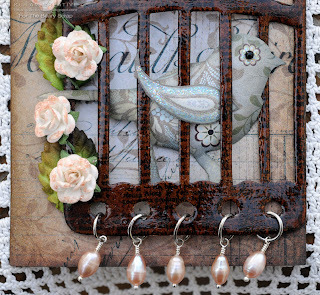 The bird and cage were cut with Tim Holtz "Caged Bird" die using grungepaper. I colored the paper with Vintage Photo Distress Stain - if you don't have that one hand you can use brown Bazzill card stock! My next step was to stamp all over the cage with the text stamp from My Mind's Eye/Portobello Road "Boy" stamp set. I used Memento Tuxedo Black ink and stamped a couple of times to cover the cage. Once that was done I covered all the cage "wires" with Glossy Accents and set aside to dry. While that dried I looked through my BG Cappella stash for a good bird paper. I decided this one worked well with the little flower "eye" and the swoosh would make a great wing. 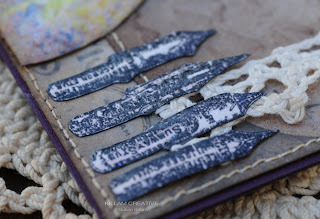 I used a Kaisercraft black pearl for the eye and gussied up the wing and eye with Star Dust Stickles. 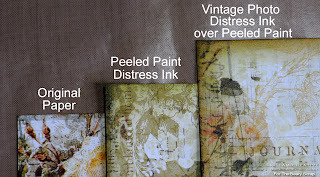 Oh, and I layered a little Vintage Photo and Weathered Wood Distress Ink on the edges. I used the FABULOUS Empressor tool to round my bird's edges and give him a little volume. All you have to do is lay the item (bird, flower, etc) on a piece of foam and make little circles with the Empressor all along the edges so they curl up. It works great with flowers "right side up" and I turned my bird upside down to make his little body stick out. I used to use vintage glass swizzle sticks and paint brush handles and find this tool so much smoother. It's a must-have! 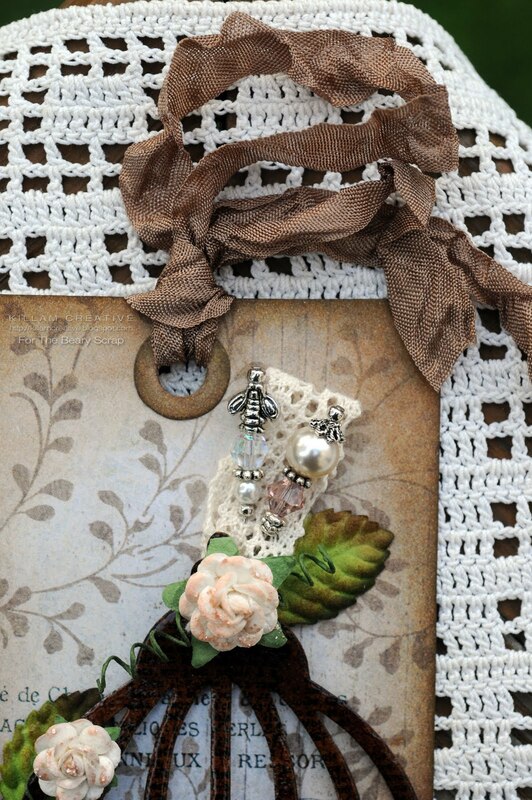 The rose vine is made of Mulberry Paper Roses and leaves from my stash. I inked them with Tattered Rose and used the same color Stickles. Once dry I jus would them around the outside edge of the cage. I love how this vine mimics the vine-y pattern on the tag background. My insect is a little bumble bee on a homemade stick pin. The seam binding (now in stock!) is Latte and oh-so-luscious. I can't wait to get my crafty little hands on all the wonderful colors! Thanks so much for visiting today. We all really hope to see your entries on our "Wings" challenge, going on now through Saturday night! Last week Patricia used Colorbox chalk ink on her Pink Paislee butterfly wood shape with great success. For my project today I decided to get out the acrylic paints and see what would happen. The paper is Pink Paislee's Butterfly Garden 12x12 sheet of "Flower Blooms". I cut is specifically to show the bumble bee and clock along the right edge. 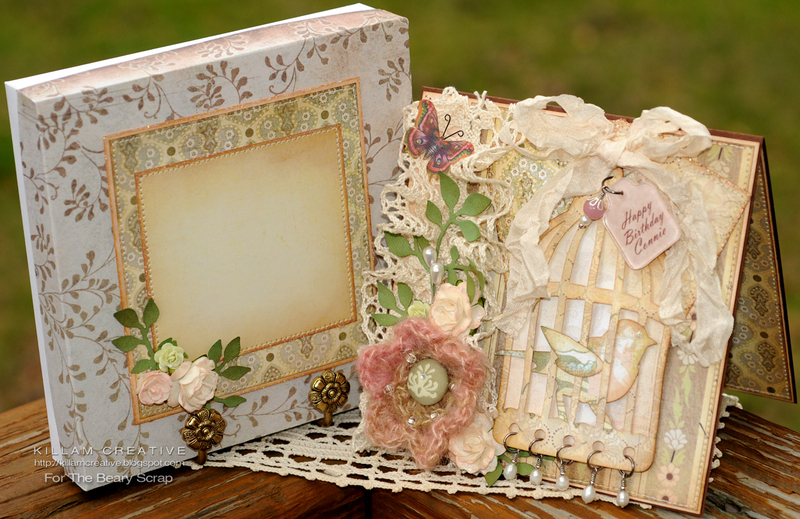 One of the things I really like about these decorated 12x12's is how I can pick and choose what section to use. The inside layers are also from the same sheet, but different sections and different 'scenes'. I'll add photos of the inside once it's completed. As the card came together I ended up putting the seam binding/calendar grouping on the right instead of the planned left corner. It covered the bumble bee but made more sense with the other elements. The Beary Scrap will have loads of seam binding on the shelves soon - I can't wait for all the yummy colors! It's all wrapped up with a button from My Mind's Eye/Lost & Found/Madison Avenue. The pin is made from my supplies. I spritzed some of the mulberry roses with Vanilla Breeze Glimmer Mist. The grungeboard swirls were colored with distress stain and then spritzed with the same Glimmer Mist. 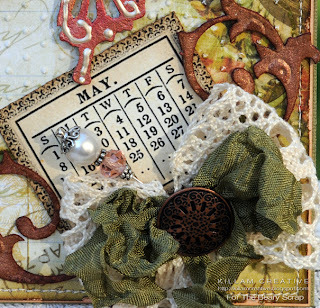 The calendar is a digital print and interchangeable with other months - I didn't attach it because I'm not sure how it will be used. I'm partial to May, though, since I celebrate my birthday all month. Ok, maybe it's really only two stages! 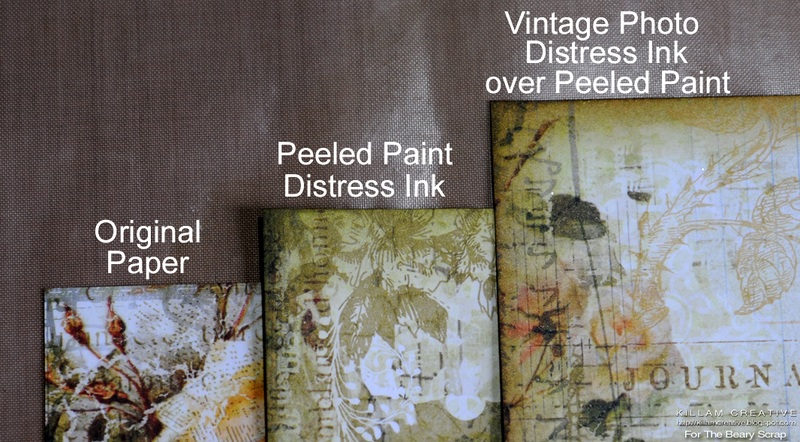 First I used green Peeled Paint on the edge and toward the middle a little, then used Vintage Photo on the edge only. Adding the Vintage Photo gives it a little more depth and a vintage feel! That's it for me. Thanks for visiting today, and remember to enter your "Wings" project in our challenge HERE by April 30th. Good luck! Hello hello! Happy Monday to you. 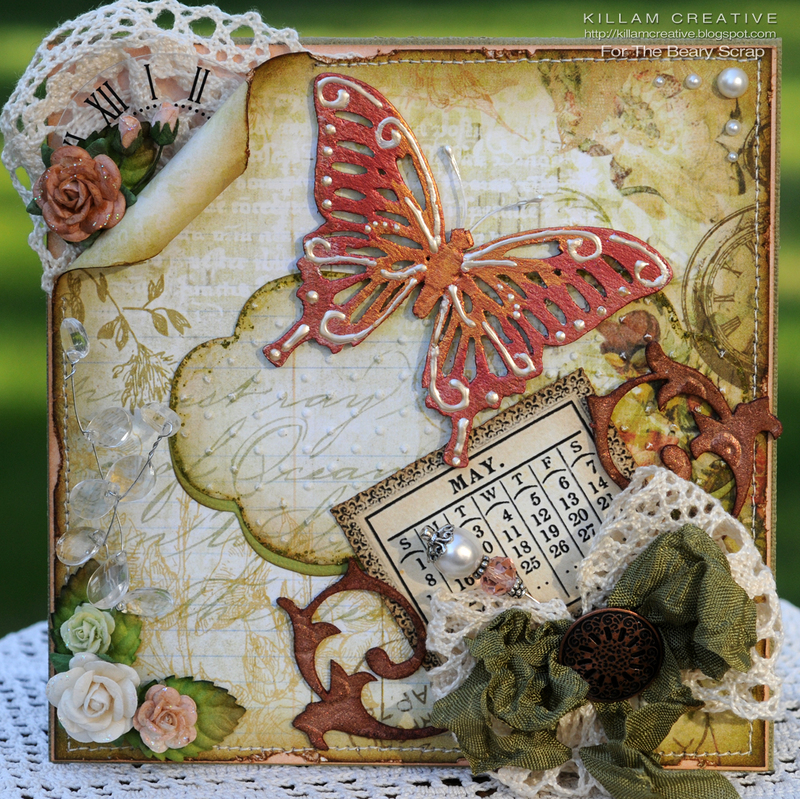 This week the design team is showing more variations of our Beary Sweet April Sketch challenge. It's such a fun, easy one! We're adding a little extra challenge to each other to add pastel colors in our projects. 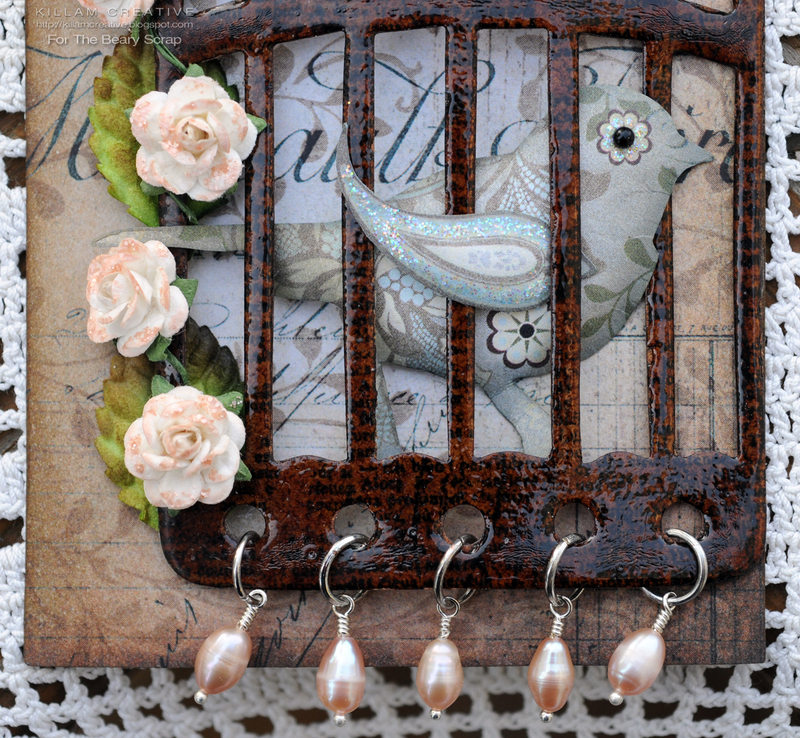 I'm still on my bird kick, so here's another version of a bird 'n cage. Funny little note - the *last* thing I feel about life is "caged in", yet I continue to play with the concept. At least the bird on this card is outside the wires! 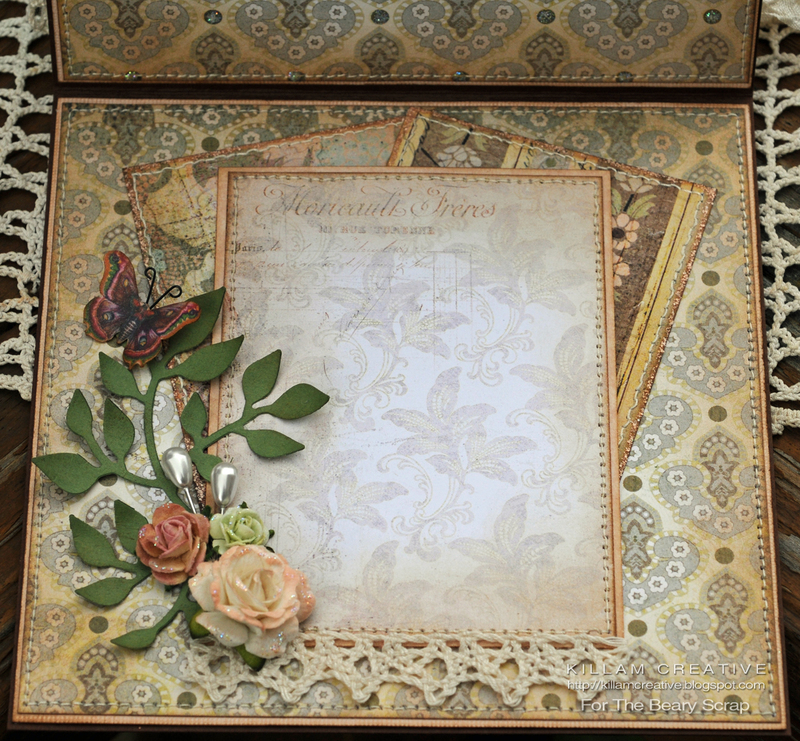 My papers are from the Prima Fairy Flora 6x6 pad. There is quite a selection of Prima pads in the store now, and they are *all* delicious! 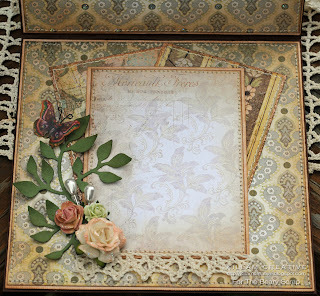 Adhesives: Scor-Tape; Fabri-Tac; Glue Dots 1/16"
So that's it for me - thanks for visiting! There are still a few days to whip up a project and enter into our BSC #23 challenge. You could win a $20 gift voucher! GM #2: What Color is the Wind? Thanks so much to the great folks at Allsorts for choosing this for their Top 5 "Anything But A Square" challenge! 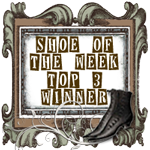 Click to see all the winners! Hello hello! 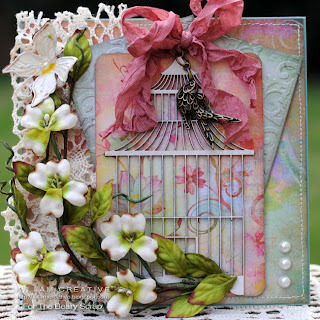 I'm here with this week's Grungy Monday challenge over at Studio L3. It was actually donedonedone Thursday, but I've been mucking about with the Beadfest show in Philadelphia, so this is the first chance I've had to post. Heh, better than last week when I posted 1 hour before the challenge closed. Ha! 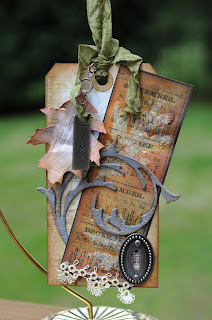 Anyway, we were tasked to use a Ranger technique demonstrated by Tim Holtz HERE (it's a video tutorial). 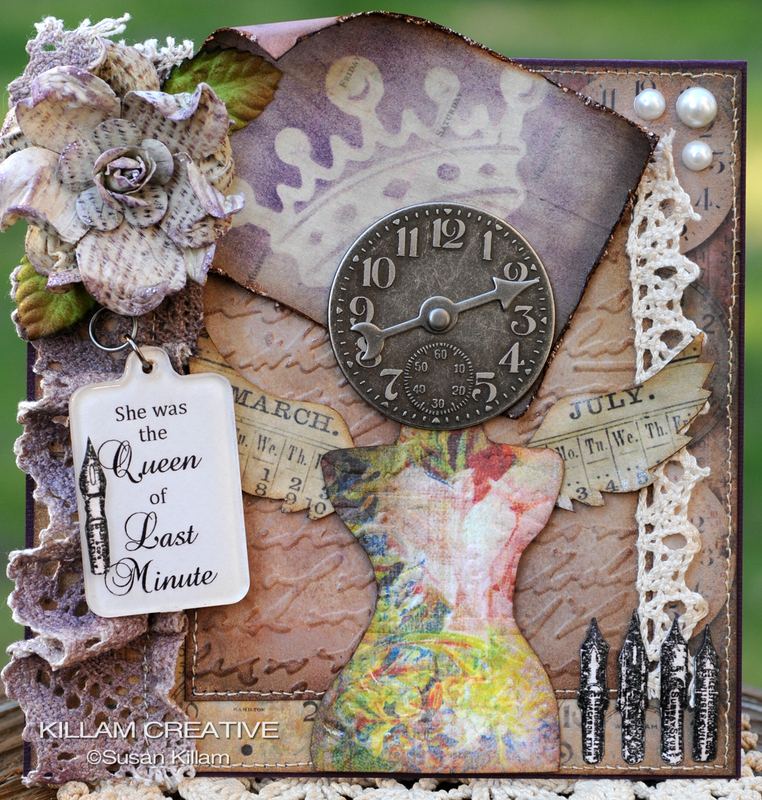 It's all about using Distress Ink with Studio Multi Medium to create this cool color resist effect. To start my design, I reviewed the TH dies I have and decided to use the Tattered Leaves. 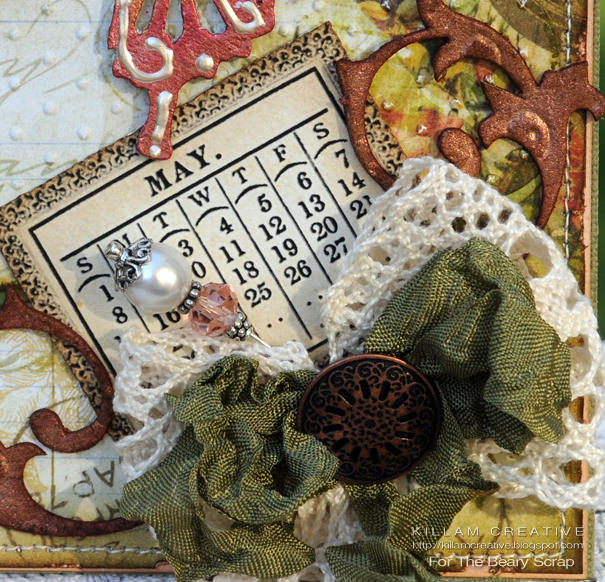 I found the calender strip unused in my paper bits and went with an Autumn theme. I suppose if I had Spring months this would look completely different! What's this about the wind, you ask? I wanted the grungeboard swirl to represent the wind and spent a lot of time debating the color of wind. Weathered Wood Distress stain won out! I spritzed it with Pearl Glimmer Mist once dry. One other detail to share: The lace is vintage tatting I scored at an antique shop. Cool, huh? Thanks for visiting! 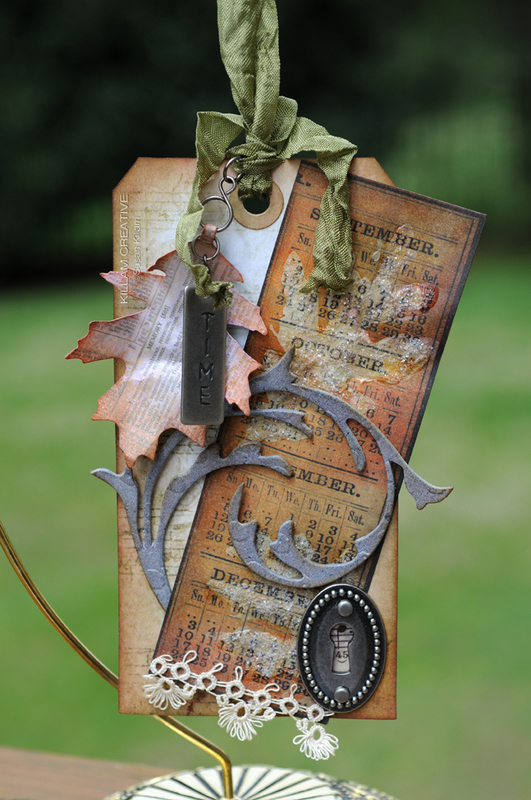 If you want to learn more about this Tim Holtz guy, check out his site HERE! 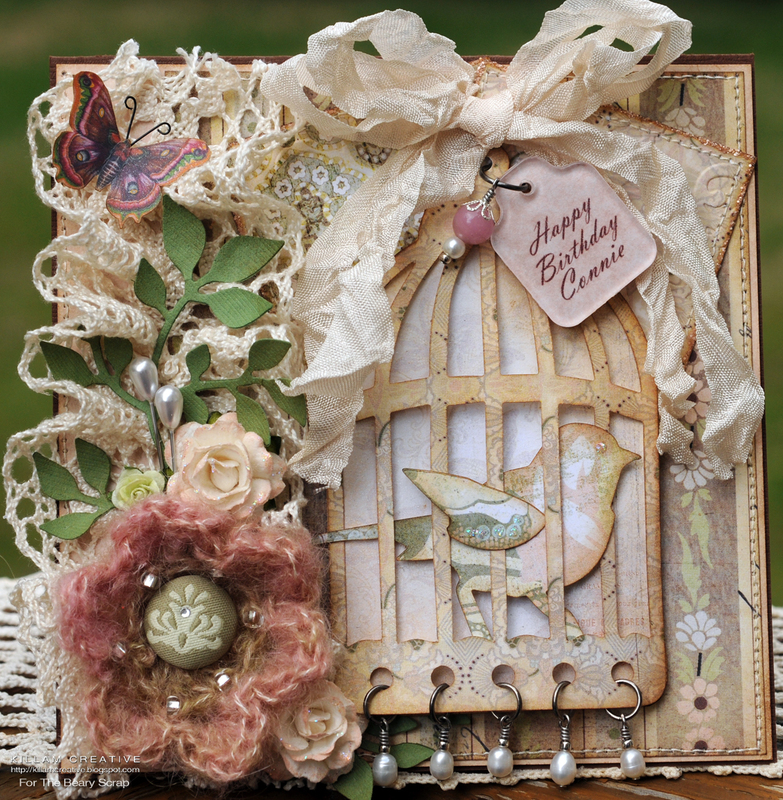 Thanks so much to the Creative Belli design team for choosing this card as one of their fabulous Belles of the Belli for the "Think Seamstress" challenge. Heartfelt thanks also go out to the fabby girls at If the Shoe Fits... Scrap It! for making this card one of their Top 3 for the Sew Crazy challenge. Hello crafty friends! 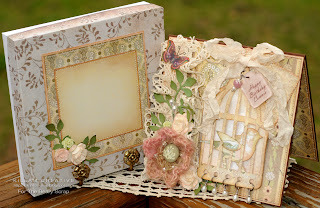 Here we are in another month, a new week and a sparkly new sketch challenge at the Beary Scrap DT & Challenge blog! It's a simple sketch but you know me - I went and complicated the whole thing with floof and stuff all over the front of my card! Ooh, speaking of floof - check out the mohair crochet flower. Isn't it divine? Check out the oh-so-talented willowfolk on Etsy for floofy goodness of your very own! I made this card for Connie's birthday.... Oh, you don't know Connie? Neither do I, actually. A lovely local lady requested the card for a friend right after she received one of my designs for her own birthday. How nice is that? I used Basic Grey's Capella papers - remember that line? It's so easy to get caught up in the "new" and lose sight of what is already on hand. Every month Kimm gets new paper lines into the store and I ooh-n-ahh over it. Very quickly the gotta have it - gotta use it now now now feeling sets in and last month's lovelies get pushed aside. Not anymore! At least, not for right now. I poked around my TBS bins and found the beautiful Basic Grey Capella line and all those warm fuzzies came rushing back. It was like an old friend reaching out for a much-needed hug... too much? *ahem* I'll move on. Adhesives: Fabri-Tac; Scor-Tape; Glossy Accents - layered between clear plastic charm and "Happy Birthday Connie"
That's it for my sketch sample. Please go HERE to our sketch challenge and join in the fun - you could win a $20 gift voucher from The Beary Scrap! Hello crafty friends! So there's this brand spankin' new challenge for those of us who like to dabble in The Grunge. It's called Grungy Monday and it's run by none other than the lovely Linda of Studio L3 fame. It's all about being inspired by Tim Holtz - whether it's a technique or product, each week Linda throws down the gauntlet and challenges us to be inspired. 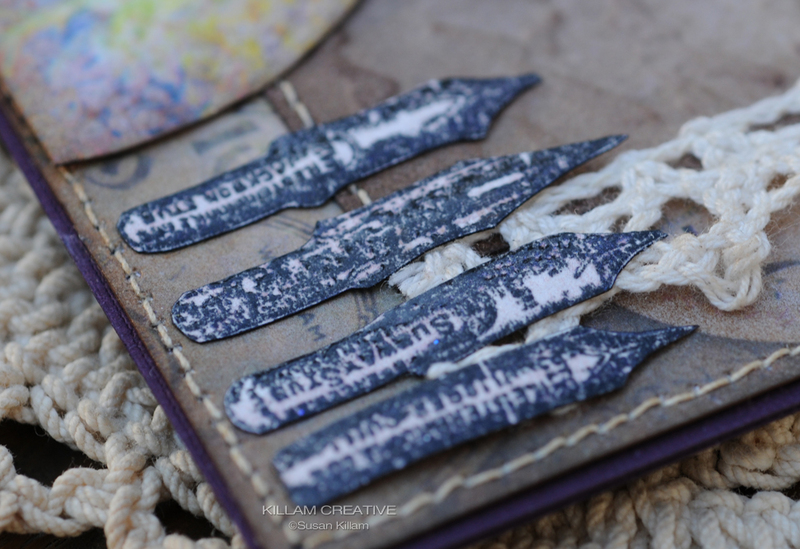 For Grungy Monday the First, we were sent to this Tim Holtz 12 Tags of Christmas 2008 post to inspect the techniques. Here's what I did with the masking technique and a Perfect Pearls concoction as well as wet embossing. The Queen of Last Minute. Oh yea, that's me. Here' it is Sunday night and the challenge closes in one hour. Queen of Last Minute? Who, me? I used purple Perfect Pearls spritz on the crown mask (and wide crochet ribbon), and the wet embossing for the pen nibs stamp was done with Versafine black ink and clear detail embossing powder. Here's a somewhat better photo of the pen nibs. I painted them with a little mixture of Perfect Pearls and water, but the purple is faint. Ok, I'm going to post and rush over to enter the challenge. I'll come back to waffle on about this card more in a bit.